Oil edged lower on Thursday but held near 2019 highs, supported by a sharp tightening of global stocks, OPEC production cuts and U.S. sanctions on key producers Iran and Venezuela. International Brent crude oil futures were down 57 cents, or nearly 1 percent, at $67.93 a barrel around 12:10 p.m. ET (1610) GMT, having hit their highest since Nov. 13 at $68.69 earlier in the session. U.S. West Texas Intermediate crude futures were down 36 cents at $59.87 per barrel. WTI reached its highest since Nov. 12 earlier in the day, at $60.39. 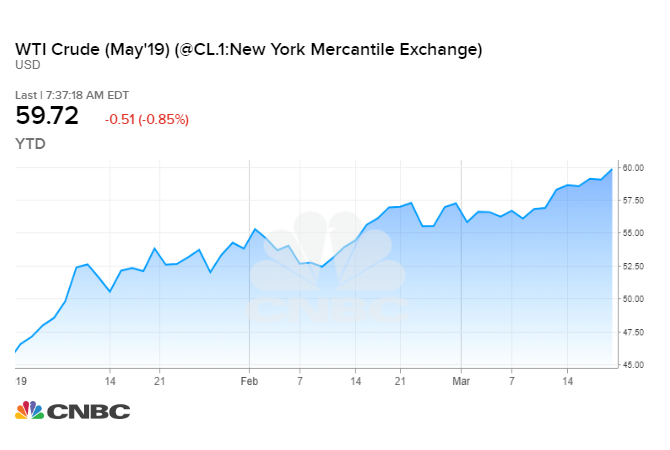 Crude prices have been pushed up by almost a third since the start of 2019 by supply cuts led by OPEC, as well as sanctions enacted against Iran and Venezuela by the United States. The drop in production has led to a tightening in global inventories. Vienna-based consultancy JBC Energy estimated stocks had run down by a “solid” 40 million barrels since mid-January. That followed a nearly 10-million-barrel fall in U.S. crude stocks last week, the largest drop since last July, boosted by strong export and refining demand, according to the U.S. government’s Energy Information Administration. The rapid decline in inventories comes despite many refineries undergoing seasonal maintenance work ahead of peak summer demand. However, global trade tensions remain a worry. “Why are oil prices not rallying through the roof? We suspect the sword of Damocles hanging over the market is currently called U.S.-Chinese trade talks,” Tamas Varga, analyst at brokerage PVM, said in a note. Meanwhile, OPEC’s crude output slumped from a mid-2018 peak of 32.8 million barrels per day (bpd) to 30.7 million bpd in February. The U.S. sanctions are disrupting supply. “With the driver of the OPEC bus, Saudi Arabia, showing no signs of wavering in the face of renewed pressure from Washington, we believe that OPEC is likely to extend the deal for the duration of 2019,” RBC said. OPEC’s crude output fell from a mid-2018 peak of 32.8 million barrels per day (bpd) to 30.7 million bpd in February. U.S. sanctions are disrupting supply. “Venezuelan exports to the U.S. have finally dried up, after the sanctions were placed on them by the U.S. administration earlier this year,” ANZ bank said. Iranian oil shipments have slumped. The United States aims to cut Iran’s crude exports by about 20 percent to below 1 million bpd from May by requiring importing countries to reduce purchases to avoid U.S. sanctions. U.S. crude production returned to its record of 12.1 million bpd last week, making America the world’s biggest producer.